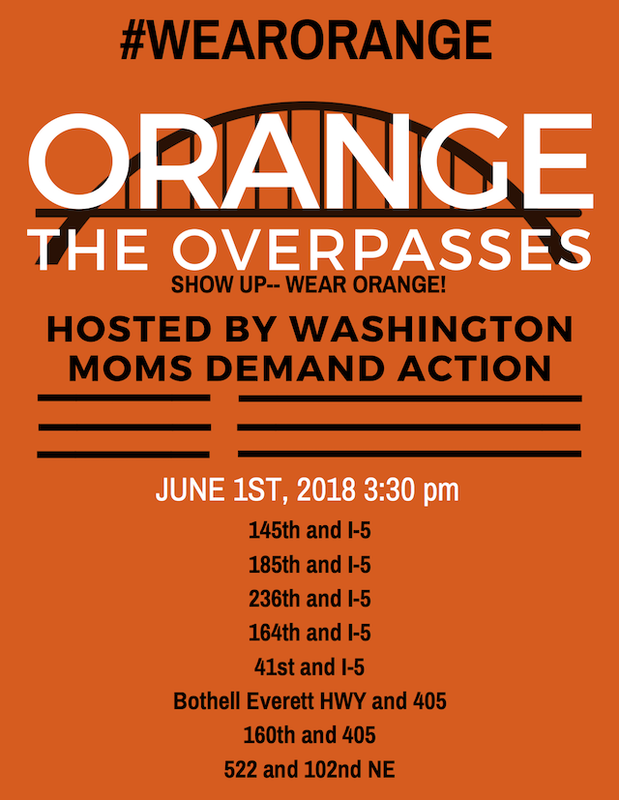 In honor of National Gun Violence Awareness Day, the Shoreline local group of Moms Demand Action for Gun Sense in America, along with local groups from Bothell/Mill Creek, Lynnwood and the Eastside, will “Orange the Overpasses” during the afternoon and evening commute on Friday, June 1st. Orange is the color that Hadiya Pendleton’s friends wore in her honor after she was shot and killed in Chicago at the age of 15 – just one week after performing at President Obama’s second inaugural parade in 2013. Spearheaded by Moms Demand Action for Gun Sense in America and Everytown for Gun Safety, the Wear Orange campaign asks Americans who believe that it is possible to do more to save lives from gun violence to wear orange on June 1st to recognize National Gun Violence Awareness Day. Those who wear orange pledge to honor the lives of Americans stolen by gun violence, to help keep firearms out of dangerous hands and to protect children from gun violence. Orange is the symbol of the gun violence prevention movement, and is used by activists all over the country to raise awareness.